Please see the previous article at http://ponnadi.blogspot.in/2013/12/virodhi-pariharangal-1.html. 10. prapaththinishtanukku karmAthyupAyangaL virOdhi (ப்ரபத்திநிஷ்டனுக்கு கர்மாத்யுபாயங்கள் விரோதி) - For one who is focussed on prapatthi, upAyams such karma, gyAna, bhakthi, etc are obstacles. 11. prapaththi upAya nishtanukku itharOpAyangaL virOdhi (ப்ரபத்தி உபாய நிஷ்டனுக்கு இதரோபாயங்கள் விரோதி) - For one who is performed prapathi as upAyam, other upAyams (such as karma, gyAna, bhakthi) are obstacles. Being relieved from repeated birth/death in this samsAram, after reaching parampadham, engaging in eternal blissful service to bhagavAn is called mOksham. To attain such mOksham there are many upAyams (means/processes). In sAsthrams, mainly 4 such upAyams are highlighted - karma yOgam, gyAna yOgam, bhakthi yOgam and praptthi. karma yOgam - Following the injunctions of sAsthram with the three thyAgams (sacrifice) namely karthruthva thyAgam (I am the doer), mamathA thyAgam (this is my responsibility) and pala thyAgam (the result is mine) and performing such activities as service to bhagavAn is called karma yOgam. gyAna yOgam - By performing karma yOgam the mind gets purified and one will understand the true nature of AthmA (oneself). Constant meditation in such state is called gyAna yOgam. bhakthi yOgam - Understanding that paramAthmA eternally exists in jIvAthmA and showing loving devotion towards bhagavAn continuously without any break is called bhakthi yOgam. Further, living in dhivya dhEsams and serving archAvathAra emperumAns in there by lighting lamps in his sannidhi, making flower garlands and offering them to him with love, cleaning the temples, etc are explained as means to attain mOksham. thirunAma sankIrthanam (singing bhagavAn's many names) is highlighted as a wonderful way to attain mOksham. This is highlighted by bhIshma pithAmaha to yudhishtra in kurukshEthram. But all of these are founded on the independent efforts of jIvAthmA. Unless these means are observed by the jIvAthmA, the result cannot be established. jIvAthmA pleases bhagavAn by performing such activities and bhagavAn benedicts the jIvAthmA with mOksham ultimately. All of these processes involve lengthy observation - potentially one goes through many life times before ultimately attaining mOksham. prapatthi - approaching emperumAn and praying to him "Dear Lord! I have nothing in my part to insist you to bless me with mOksham. I have nowhere to go other than your esteemed self. I accept you as my total refuge. Pless bless this poor soul". nammAzhwAr explained this state in thiruvAimozhi 5.7.1 pAsuram "nORRa nOnbilEn, nuNNaRivilEn, Agilum ini unnai vittu onRum ARRaginRilEn aravinaNaiyammAnE" (நோற்ற நோன்பிலேன், நுண்ணறிவிலேன், ஆகிலும் இனி உன்னை விட்டு ஒன்றும் ஆற்றகின்றிலேன் அரவினணையம்மானே) and in thiruvAimozhi 6.10.10 "thiuvEngataththAnE! unnadikkIzhamarnthu pugunthEnE" (திருவேங்கடத்தானே! உன்னடிக்கீழமர்ந்து புகுந்தேனே). ALavanthAr highlights the same in sthOthra rathnam as "thvath pAdha mUlam charaNam prapadhyE" (த்வத் பாத மூலம் சரணம் ப்ரபத்யே). In "charaNam prapadhyE", one may think that "the act of taking refuge" is the means. But that is not true. In place of prapatthi, bhagavAn himself is the upAyam. sharaNAgathi is defined in sAsthram as "'thvamEva upAya bhUthO mE bhava' ithi prArththanA mathi:" ('த்வமேவ உபாய பூதோ மே பவ' இதி ப்ரார்த்தனா மதி:) - surrendering means "praying and having the confidence that 'you are the only upAyam for me'"). In bhagavath gIthA, bhagavAn orders "sarvadharmAn parithyajya mAm Ekam charaNam vraja" (ஸர்வதர்மாந் பரித்யஜ்ய மாம் ஏகம் சரணம் வ்ரஜ) - Completely give up all other upAyams and accept me alone as the upAyam. This is why in the commentary for 10th point, vangi puratthu nambi says "sarvEsvaran (an established upAyam) who is implied by the word prapaththi is the only upAyam". siddham means established - like food prepared and presented. sAdhyam means "to be established" - like uncooked rice, lentils, etc. which need to be cooked separately and eaten. Accepting bhagavAn as the upAyam is called siddhOpAya varaNam. This is called sharaNAgathi, prapatthi. This is why bhagavAn himself is explained as prapatthi and siddhOpAyam in the commentary for 10th point. 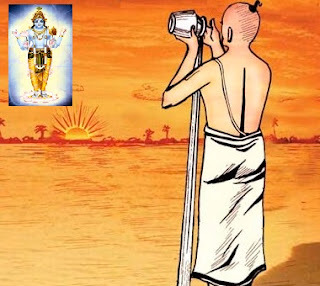 One who pursues other upAyams such as karma, gyAna, bhakthi, etc (instead of accepting bhagavAn himself as upAyam) is called upAyAnthara nishtan. For the ones who have total faith in bhagavAn as the upAyam, involvement in such upAyams will be an obstacle. sAdhyam - attaining something by self-effort. Here we should certainly remember an important aspect. Whatever karmAs ordered in sAsthram - they must be fulfilled. Giving them up is considered as great blunder. It is a violation of bhagavAn's own orders. 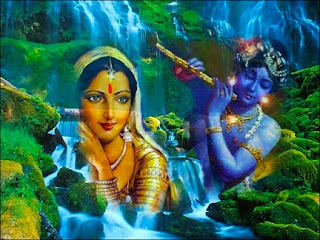 One must consider that "I am performing this karmA per bhagavAn's orders as a kainkaryam for him" and perform the same. piLLai lOkAchAryar highlights in mumukshuppadi sUthram 271 "karmam kainkaryaththil pugum" (for prapannas, all activities that are done according to sAsthram will count as service to bhagavAn). Translator's note: Here we have to understand the difference between siddha sAdhanam and sAdhyam (sAdhya sAdhanam). siddha sAdhanam (siddhOpAyam) - siddham means that which is already established - ready to be accessed. An example is food that is prepared and presented readily for eating. One needs to simply eat the food. bhagavAn is always present and ready to shower his mercy towards all the jIvAthmAs (one needs to simply accept that). Accepting bhagavAn's mercy is called siddhOpAya varaNam. This is sharaNAgathi, prapatthi. This is why bhagavAn is explained as prapatthi sabdha vAchyan (the one who is indicated by the word prapatthi) and siddhasAdhana bhUthan (the entity who is already an established upAyam). sAdhya sAdhanam (sAdhyOpAyam) - sAdhyam means to be accomplished. An example is having rice, lentils, vegetables, etc - all these need to be cooked to have edible food. All upAyams such as karma, gyAna, bhakthi etc., are principles that are to pursued by a jIvAthmA. Only by the pursuit of jIvAthmAs, these upAyams become established. The other fine difference is - bhagavAn is parama chEthanan (supremely knowlegable) - so only he can benedict the ultimate result. All other upAyams are achith (insentients - which have no knowledge of themselves) - by one performing the particular upAyam - it is bhagavAn who becomes pleased and blesses the ultimate mOksham. 12. bhagavathkarmanishtanukku dhEvathAnthara karmanishtai virOdhi (பகவத்கர்மநிஷ்டனுக்கு தேவதாந்தர கர்மநிஷ்டை விரோதி) - For the one who is focussed on kainkaryam (service) to bhagavAn, engaging in actions for other dhEvathAs is an obstacle. 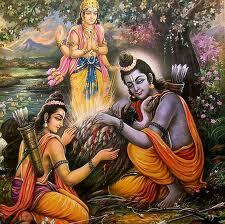 srIman nArAyaNan who is sarvEsvaran and supreme to every one can be identified with the term "dhEvan" (God). brahmA, shiva, indhra are also considered as dhEvas. But these dhEvathAs are also jIvAthmAs. Just like wealthy people are approached by normal people and praised to get wealth, these dhEvathAs are in a higher position than normal humans and the humans can approach them get certain benefits. 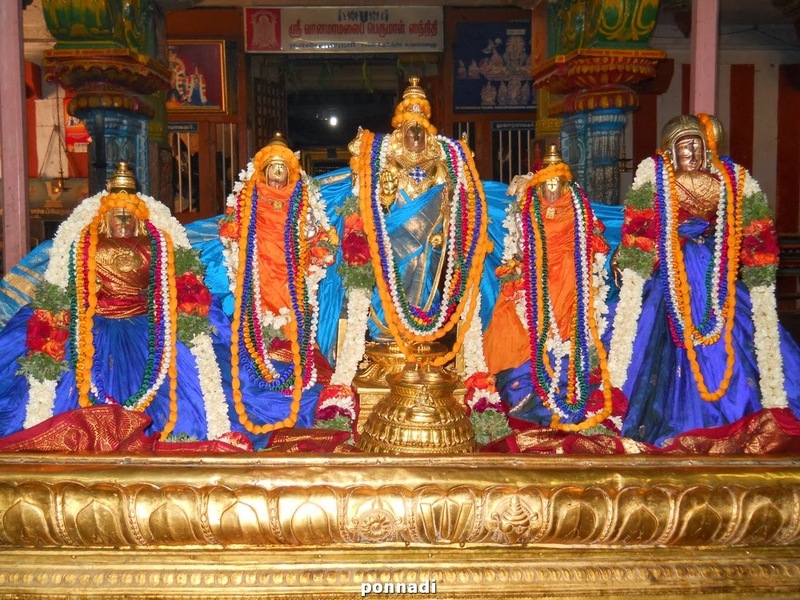 These dhEvathAs are established by srIman nArAyaNan as highlighted by thoNdaradippodi AzhwAr in thirumAlai 10th pAsuram "NAttinAn dheivangaLAga ... ath dheivanAyagan thAnE" (நாட்டினான் தெய்வங்களாக ... அத் தெய்வநாயகன் தானே) - emperumAn who is the God of all Gods established these dhEvathAs for the welfare of others. These are called dhEvathAnthrangaL (Other dhEvathAs). When we perform our activities as kainkaryams to bhagavAn, bhagavAn will be pleased and we will observe happiness in his face. This is ideal for us. Bringing happiness in his face is the sole purpose for our existence. From these we can understand easily that engaging in activities for dhEvathAntharams (any one other than emperumAn and his devotees) is an obstacle for bhagavath kainkaryam. Translator's note: In this principle, one must clearly understand the difference between sAsthra vihitha karmams (activities which are established by sAsthram) and others. Let us see this with an example. We (brAhmaNa, kshathriya, vaisya) perform sandhyA vandhanam thrice every day. In this also, there are specific offerings for dhEvathAs like agni, sUrya, indhra, varuNa, etc - but we observe that srIman nArAyaNan is the antharyAmi in these dhEvathAs. But our pUrvAchAryas performed these nithya karmAs as kainkaryam to bhagavAn since these are mandatory based on ones own varNam. So, anything which falls under nithya karmA (sandhyA vandhanam, etc) and naimiththika karmA (tharpaNam, etc) are performed. But we dont engage in any activities involving dhEvathAntharms in their own temples. nampiLLai gives a classical explanation for this situation. This is highlighted in 6000 padi guru paramparA prabhAvam. Once, some one goes to nampiLLai and asks him "You all are so fixated on worshipping emperumAn only. 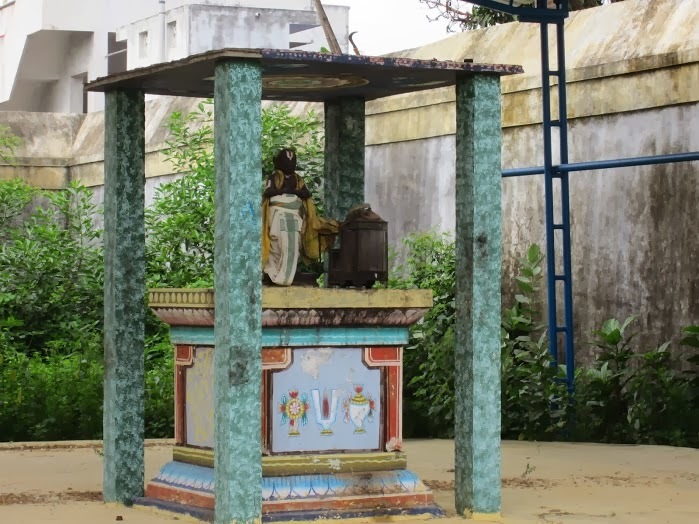 While you are worshipping dhEvathAs such as agni, indhra, etc in nithya/naimiththika karmAs, why are you not worshipping dhEvathAntharams in temple?". nampiLLai explains "Listen! the difference is like accepting the fire from agni hOthram (yAgam/hOmam) and rejecting the fire from a crematory". Fire from yagya is considered as pure but fire from burning corpse is considered as impure - even though both are fire. He further explains "Whatever is performed in our nithya karmAs, they are explained as part of our worshipping of emperumAn in sAsthram. But dhEvathAnthrams present in temples have the following defects - a) the ones who establish such temples will be of thAmasa (ignorant) nature and would not know the distinction between supreme lord and others and b) they may have used Agamas which are contradictory to bhagavath thathvam and established the dhEvathAs as independent forces". Further he says "There is no specific rule in sAsthram to worship other dhEvathAs (outside nithya/naimiththika karmA) - so its not appropriate to do that for prapannas. Moreover, rudhran is top-most in the list of dhEvathAs who should be completely avoided. This is because, he is filled with thamO guNam which is direct opposite to sathva guNam - so he cannot be worshipped in temples considering that he is also pervaded by emperumAn (as antharyAmi)". Finally, he says "Why should we give up nithya/naimiththika karmAs which are favourable in developing our sathva guNam and why should we take up dhEvathAnthara worship which are unfavourable for our bhagavath kainkaryam?". From these we can understand that worshipping dhEvathAnthrams in temples, even if they are properly established using vEdha Agamam - it is to be given up for prapannas. In this day and age, there are so many new dhEvathAs that are created every day in every nook and corner. There are also many self-styed gurus who dont accept vEdham as authority and teach whatever they think is the philosophy. It is best for prapannas to enquire from elders (learned scholars) and follow what is done by our pUrvAchAryas instead of being caught in the vicious cycle of ignorance. 13. bhagavath kainkarya nishtanukku dhEvathAnthara bhajanam virOdhi (பகவத் கைங்கர்ய நிஷ்டனுக்கு தேவதாந்தர பஜநம் விரோதி) - For the ones who are focussed on bhagavath kainkaryam, worshipping other dhEvathAs is an obstacle. praNavam which is the essence of all of vEdham establishes that jIvAthmAs (secondary/subservient) exist solely for the purpose of srIman nArAyaNan who is the cause of all of creation, who is the protector for everyone and is the supreme personality. Thus, being situated/engaged in kainkaryam for bhagavAn (who is the natural lord and master) is natural for the jIvAthmA. For such persons engaged in bhagavath kainkaryam, having any relationship with other dhEvathAs is a major obstacle. Translator's note: In the vyAkyAnam, "pathim visvasya" (பதிம் விச்வஸ்ய - master of the whole universe) pramANam is quoted. pathi generally means "husband/master". For a woman, once she gets married to a man, she is totally surrendered to her husband and cannot focus at any one else. 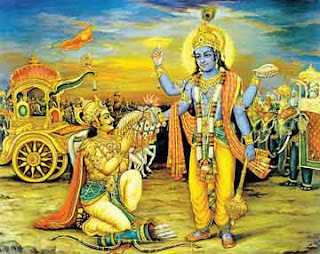 Similarly, when jIvAthmA realizes his svarUpam that he is a servant of bhagavAn, he must be totally surrendered to bhagavAn. Thus, jIvAthmA has nothing to do with dhEvathAntharams after such realization. Not only that, thirumangai AzhwAr declares in periya thirumozhi 8.10.3 "maRRumOr dheyvam uLadhenRu iruppArOdu uRRilEn" (மற்றுமோர் தெய்வம் உளதென்று இருப்பாரோடு உற்றிலேன் - I will not associate with anyone who believes that there is another God than srIman nArAyaNan) - one should carefully avoid dhEvathAnthara nishtars. 14. bhagavathupAya nishtanukku prapaththi virOdhi (பகவதுபாய நிஷ்டனுக்கு ப்ரபத்தி விரோதி ) - For the ones who consider bhagavAn alone as the means, considering their own act of surrender as the means is an obstacle. We can recollect what is discussed in points 10 and 11. One who firmly considers emperumAn as upEyam (goal) and upAyam (means) is called an uththama adhikAri (top-most devotee). bhagavAn himself orders "thamEva charaNam vrajEth" (தமேவ சரணம் வ்ரஜேத் - Surrender unto bhagavAn only) and "mAmEkam charaNam vraja" (மாமேகம் சரணம் வ்ரஜ - Surrender to unto me only). For such persons, their act of surrender that is highlighted in "prapadhyE" is not the means (it is only a natural state of acceptance). A person who pursues karma, gyAna, bhakthi, etc is called madhyama adhikAri (mediocre devotee - as there is the constant emphasis on self-effort). The one who considers their own prapatthi as the upAyam (means) falls into the category of madhyama adhikAri. Such act is an obstacle for prapannas - similar to karma, gyAna, bhakthi yOgams, etc. 15. sAdhyOpAya nishtanukku nivruththi virOdhi (ஸாத்யோபாய நிஷ்டனுக்கு நிவ்ருத்தி விரோதி) - For the ones who are focussed on karma, gyAna, bhakthi, yOgams, etc., giving up self-efforts is an obstacle. 16. sidhdhOpAya nishtanukku pravruththi virOdhi (ஸித்தோபாய நிஷ்டனுக்கு ப்ரவ்ருத்தி விரோதி ) - For the ones who are focussed on bhagavAn as the upAyam, engaging in self-efforts is an obstacle. Please see discussions on points 10 and 11 to understand siddhOpAyam and sAdhyOpAyam. pravrutthi means engaging in actions with self-effort. nivrutthi means withdrawing from self-efforts. sAdhyOpAya nishtan - one who desires to accomplish a goal based on ones own effort. siddhOpAya nishtan - one who accepts bhagavAn (who is already established as upAyam) as his means and expect him to relieve him of the miseries (samsAram) as explained by nammAzhwAr in thiruvAimozhi 5.8.8 "kaLaivAy thunbam kaLaiyAthozhivAy kaLaikaN maRRilEn" (களைவாய் துன்பம் களையாதொழிவாய் களைகண் மற்றிலேன்). These prapannas will not engage in any activity with the consideration that they are performing it as upAyam (means). nammAzhwAr declares them in thiruvAimozhi 5.7.5 as "cheytha vELviyar" (செய்த வேள்வியர்) - this is explained in samskritham as "krutha kruthyan" (க்ருத க்ருத்யன்) - one who has already performed all necessary acts. For prapatthi, the main definition is "to give up ones own self-efforts". sAdhyOpAyan (one who is engaged in karma yOgam, etc) can not give up self-efforts - they have to keep on performing them with the goal achieving the results. For him, giving up self-efforts is an obstacle. But for siddhOpAyan - this is directly opposite. He cannot engage in self-efforts in pursuit of the goal. Such self-efforts will be an obstacle for him. These principles of pravrutthi and nivrutthi are explained by piLLai lOkAchAryar in srIvachana bhUshaNa dhivya sAsthram in sUthrams 80 - 82 (and subsequent sUthrams) while explaining "adhikAri kruthyam - adhikAri nishtA kramam". Please refer to it and have a clear understanding. Translator's note: In srIvachana bhUshaNa dhivyasAsthram, in the particular section referred here, some fine examples are given by piLLai lOkAchAryar for upAyam and upEyam. mAmunigaL's precise vyAkyAnam is most valuable for these principles. Let us see them briefly. For upAyam (accepting bhagavAn as means), sIthA pirAtti, dhraupadhI and thirukkaNNamangai ANdAn are the ideal examples. 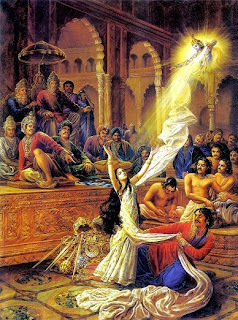 sIthA pirAtti gave up her own shakthi - she is powerful herself and could have easily destroyed lankA and rAvaNa. 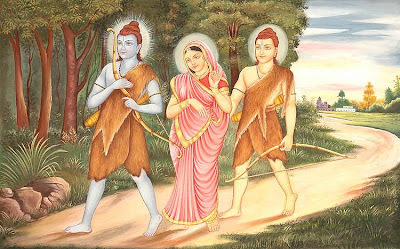 But she waited for srI rAma to come and rescue her. dhraupadhI gave up all shyness and lifted her hands up calling out for emperumAn with full faith that she will be protected by kaNNan emperumAn - surely she was protected. thirukkaNNamangai ANdAn gave up all self-efforts/activities and fully served thirukkaNNamangai bhakthavathsalan emperumAn. He observed two dogs fighting outside and seeing that the owners of the dogs also starting to fight. Seeing this, ANdAn thought "if the owner of the dog will come for the rescue of the dog, why not my owner (bhagavAn) will protect and nourish me? why should I engage in external activities?" and just gave up everything at once. For upEyam (engaging in bhagavath kainkaryam), iLaya perumAL (lakshmaNan), periya udaiyAr (jatAyu), piLLai thirunaRaiyUr araiyar and chinthayanthi are ideal examples. iLaya perumAL accompanied srI rAma everywhere and constantly served him since he cannot sustain himself without constant accompanying and kainkaryam to emperumAn. periya udaiyAr (jatAyu maharAjar) and piLLai thirunaRaiyUr araiyar gave up their bodies in protecting sIthA pirAtti and archAvathAra emperumAn respectively. chinthayanthi is a gOpikA who was unable to leave her residence to see krishNan, having derived great pleasure in listening to emperumAn's flute and in the process - out of extreme sorrow of not being able to meet emperumAn, gave up her body. For further details, please approach a qualified AchArya and learn these intricate principles. Please send an email to adiyen - sarathy_t@yahoo.com - will try to suggest you based on the place where you are residing.